FDA staff are returning to paid work today after the longest government shutdown in U.S. history. But with temporary funding set to lapse Feb. 15 and President Donald Trump skeptical a deal can be reached, the agency may be plunged back into a shutdown in less than three weeks. In signing a temporary funding bill late last week, Trump has enabled furloughed FDA staff to return to work today. 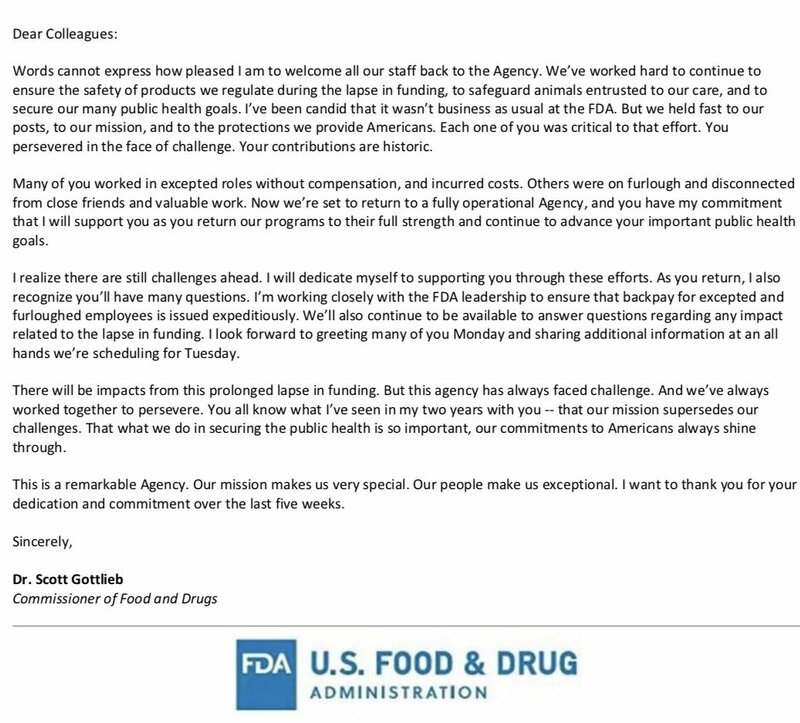 FDA Commissioner Scott Gottlieb said he is working to get back pay to staff by the end of the month and is otherwise taking actions to ensure they and the agency can get back to normal as soon as possible. But Gottlieb thinks it will take time to recover from the 35-day shutdown. The end of the shutdown clears some of the near-term threats faced by the FDA. If its pool of money from prescription drug user fees had run out, the FDA may have been forced to stop performing drug reviews, thereby delaying the processing of applications. The FDA had weeks of user fees left as of the end of the shutdown but now has a chance to top up by reopening its offices for submissions. How long the FDA remains open and able to accept user fees is unclear, though. The deal that ended the shutdown will fund the government until Feb. 15. To avoid a shutdown after that date, politicians will need to pass a new deal and get it signed by Trump. Speaking to The Wall Street Journal, Trump put the chance of that happening before the funding runs out at less than 50%. Trump’s skepticism stems from a belief that lawmakers will struggle to agree to a deal that includes the $5.7 billion he wants to go toward the construction of a wall on the border between the U.S. and Mexico. The funding is a red line for Trump, who needs to sign off on the deal. Faced with the standoff, Trump said another shutdown is “certainly an option.” If that happens, the FDA will again furlough staff and shift its focus to ensure it can meet its public health obligations.